How many more diverse roles do you think lie within Siddharth? It’s definitely way more than one, as Ennakul Oruvan has proved (oxymoronically) yet again. The nuanced actor shines in his latest film charting territories that are both unknown and seemingly too life like for the star. He tugs at our heartstrings with innocence as the simplistic torch bearing Vignesh, donning a look and lack of confidence many of us may have never been able to envision him in before. To see the handsome and savvy pan-Indian actor, producer and singer in a role devoid of traditional ‘heroic’ allure and little self-awareness, was both unnatural and yet welcoming; and he still managed to evoke an irresistible charm. On the other hand, as the charismatic and reclusive film star Vicky, he instills us with guilt! In most cases, a character such as Vicky’s would likely bring about only jealousy amongst viewers – envious for the glamorous life of the film star seen on screen. But, with Siddharth’s earnest and vulnerable performance (aided by a fabulous debutant director in Prasath Ramar and a script that rightfully honors the brilliance of the original Lucia) he infuses us with remorse for the way we indulge in celebrity gossip in our daily lives; the film and his portrayal are emotional reminders that we tend to forget the value of privacy and the dangerous impact our star-crazed society can have on the stars themselves, who are all humans first – deserving of privacy too. (Some may choose to argue that in this role the highly private Siddharth barely had to act, as he played a character he may have easily related to in real life himself!). But what all these conflicting reactions/impacts of his performance in just one film ultimately state is that Siddharth is undoubtedly one of the most versatile Indian actors of our generation, and, most likely, one of the few who will experience true longevity in this industry without being typecast – all because of his undeniable talent and his unfailing conviction to work in cinema that stands apart. In his last 3 films alone we have seen him tackle a range of roles and diversity of characters that some actors do not see even in a lifetime of work. And with some creative analysis, it could be said that Siddharth’s characters and choice of films (that have released) in the last year alone are a metaphor and testament to his approach to the industry over his first 25 film span. In Jigarthanda we saw a fiercely determined Karthik, ready to risk it all to be known for his storytelling and to make an uncompromising name for himself in cinema. In real life, Siddharth’s selectiveness, much like that of Karthik, has served him extremely well over the years, such that his filmography is one to be celebrated and respected. 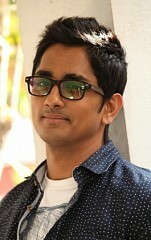 Without being held back by his initial “chocolate boy” tag we saw Siddharth refuse to remake his own hits, despite the near guaranteed commercial gain, and instead involve himself (as both a producer and actor) with new projects, progressive filmmakers, movies with strong messages and films that did not necessarily promise mass appeal but would certainly be regarded as landmarks in Indian cinema. As he recently mentioned at the 2015 Behindwoods Film Festival, he continues to receive praise for his participation in 2006’s Rang De Basanti – and that’s not something many artists in the world’s most saturated film industry can say. The parallel between Siddharth and his Kaaviya Thalaivan character of Kaliappa is most obviously his ability to perform, and execute seemingly any role that comes his way with conviction. In Kaaviya Thalaivan we saw him portray peaks of dramatic emotions, embodying the spirit of artists in a time period well before his. To say that this is the same actor who can also cause side-splitting laughter just as easily portraying a failing romeo in Theeya Velai Seiyyanum Kumaru as he would evoke disgust as an antagonistic child of British independence in Midnight’s Children and cause you to feel pity for him as a romantically unfortunate but terribly talented 1920s Madras theatre artist seems ridiculous…but all of it has already happened. And of course like Enakkul Oruvan’s Vicky, most fans have come to appreciate the real life artist’s respectful requests for privacy, as he chooses to let his work speak for itself and strives to be considered an actor more than he is a star. Siddharth’s film career thus far is enough to show us that he is multitalented, savvy and daring – committed to being a part of films that stand the test of time and simultaneously preserve and advance the excellence of Indian cinema. And, the most entertaining part about Siddarth’s brand of cinema is that, with his adaptability and steadfastness, we have no idea what he’ll pull off next. Do you know who Rajinikanth is? Thala - Using his status to lead ! "Using Film for Societal Change"
"How the South Shapes Bollywood"
"A Marriage of Film and TV"
Vishwaroopam: A first hand account from across Atlantic!